This is the third in a series of guests posts that feature Archtober Building of the Day tours! 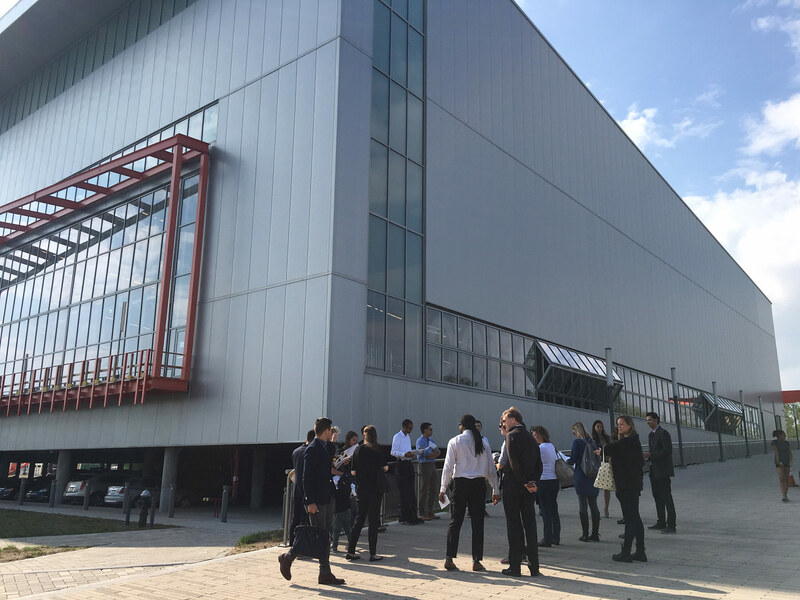 Joshua Keay, AIA, LEED AP, associate at Sage and Coombe and project architect for the Ocean Breeze Athletic Facility, led us through an in-depth tour of the massive competitive indoor track and community recreation facility in South Beach, Staten Island. A project under Mayor Bloomberg’s Design Excellence initiative, the athletic complex was designed as part of the PlaNYC 110-acre Ocean Breeze regional park. 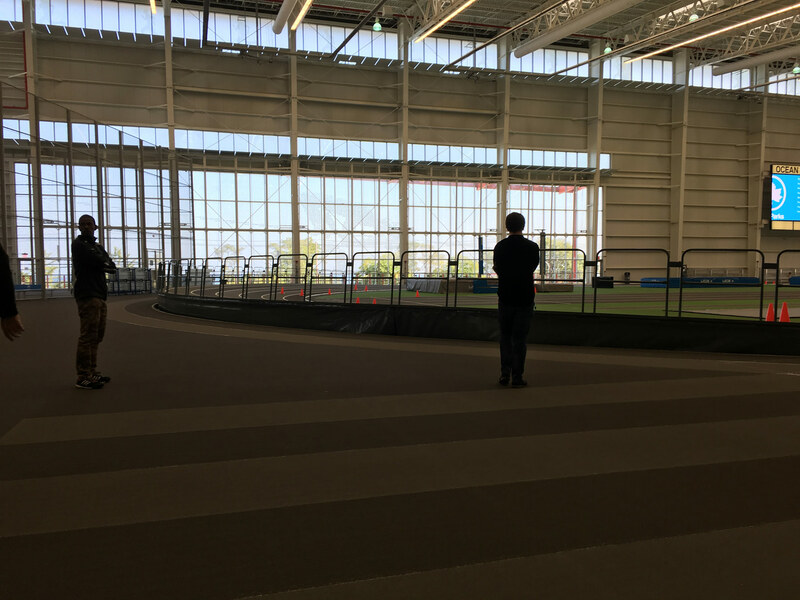 As Sage and Coombe’s first track facility, they engaged sports consultants and a local organization of runners to help determine certain features of the space, including the radius of the track. 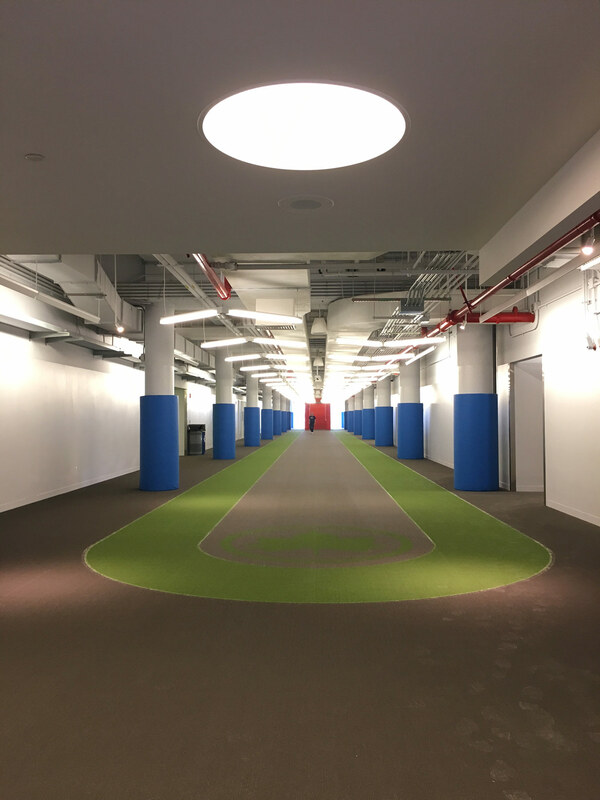 The competitive track is supported by more than 600 raised piles, allowing for a split program: A publically accessible gym on the ground floor is separated from the elevated track on the second floor. The two spaces are connected by a large secondary warm up space, which is equipped with arrow-shaped lowlights to designate the running direction. Green stairs lead athletes up to the starting line and, once they have completed their race, they exit the track through red stairs and enter the warm up space again. 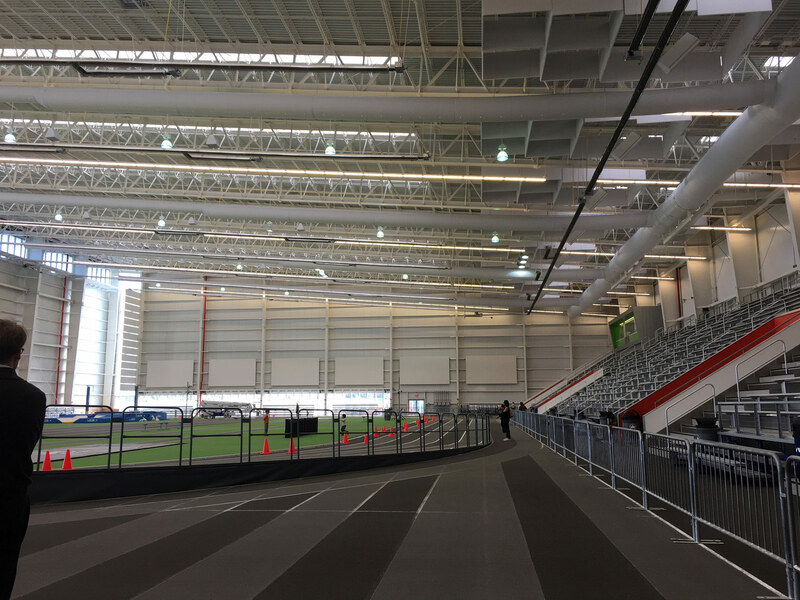 Ocean Breeze is the most state-of-the-art indoor track and field facility in the tri-state area, equipped with a variable banking hydraulic track that can be raised or lowered depending on the sporting event. The 250-foot-long elevated platform of the pre-engineered space was used to assemble the ceiling trusses, which were then lifted into the air using the free-standing columns. While the city required the project to achieve LEED Silver Certification, Keay noted that, upon completion, it will most likely be LEED Gold certified. A stormwater collection system on the roof runs water along the second-floor terrace and into ponds that recharge natural wetlands to the north of the site. Bi-fold doors on the north, east, and south sides of the building and exhaust fans provide natural ventilation. 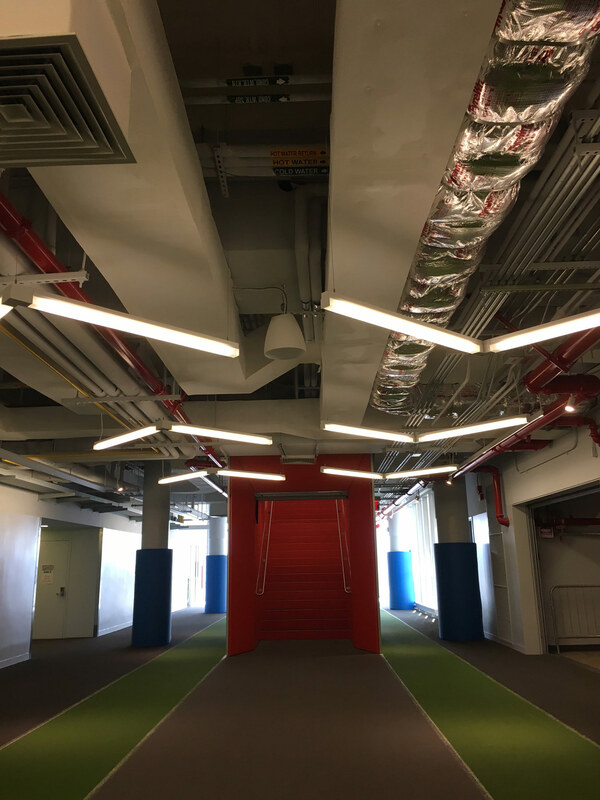 A multi-tiered lighting system with skylights, track lighting, and point fixtures respond to the amount of daylight to determine the level of artificial light required to keep the competitive track at TV-quality. A photo-finish system, which can capture frames at one-one thousandth of a second was installed at the end of the finish line. After jumping through a few hurdles, particularly after a six-month Superstorm Sandy delay, the project opened in the fall of 2015. The season will begin next month, but community users are already avidly using the public spaces. Tomorrow we visit Selldorf Architect’s AIA New York Design Awards winning David Zwirner Gallery! About the author: Camila Schaulsohn is the Communications Director and Editor-in-Chief of the AIA New York Newsletter.